Are you ready to build a team of cool dinosaurs and explore levels? 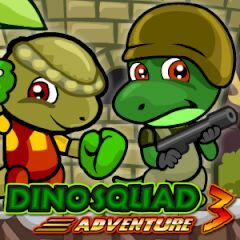 Play solo or with your friend and assume controls of these cute dinos. Just move them and work in team to collect coins, deal with enemies and obstacles. Get meat to replenish health and maximize points in the end of the level.